With the clock ticking until Prince Harry and Meghan Markle tie the knot, here's what you need to know about the wedding of the year. The couple will wed at noon at St George's Chapel in Windsor, where the prince was christened and Ms Markle was baptised. 13:00 The newlyweds travel in an open carriage as part of a 25-minute procession from St George's Chapel through Windsor town. Afternoon: There will be a reception at St George's Hall for the couple and their guests. All the main UK broadcasters are devoting much of Saturday to the occasion. The coverage will be streamed live on the BBC News website or on BBC iPlayer. The BBC has waived the TV licence fee for public screenings, meaning street parties and other special events can screen the wedding live without buying a licence. As many as 100,000 people are expected to descend on Windsor for the day, but be warned - rail bosses say it will be "extremely busy". Queuing systems will be introduced at several stations - most likely London Waterloo, Slough, Staines and the two stations in Windsor - to avoid overcrowding on platforms. Services between Windsor and Slough will run every 20 minutes, with trains increased from two carriages to four - the maximum that can operate on the local line. South Western Railway will double its direct Windsor services from London Waterloo to four per hour and use 10-carriage trains. Make sure you get there early, though - Thames Valley Police may order trains not to stop at Windsor if visitor numbers become a safety issue, and the wedding route could be closed off to latecomers. Passengers are also being asked to keep baggage to a minimum as security checks on excess luggage could delay journeys. People planning to travel by car are being warned by the Royal Borough of Windsor and Maidenhead to book parking in advance, as spaces are limited. Motorists should also be aware of road closures along the procession route, starting at 22:00 BST on Friday. In Windsor, viewing areas will be created along the procession route. There will be live entertainment in the town centre, which will be decorated with bunting and banners. 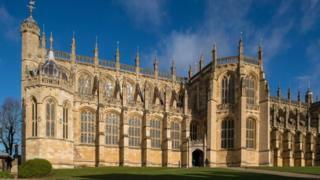 Big screens showing live footage of the wedding will be shown on the Long Walk and in Alexandra Gardens in Windsor. Invitations have been sent to 600 guests, with a further 200 invited to the couple's evening reception - including the Spice Girls. Ms Markle's father, Thomas Markle, will not attend the wedding, following recent reports that he had to undergo heart surgery. It was announced on Friday, the day before the wedding, that Prince Charles will walk Ms Markle down the aisle in her father's absence. The Prince of Wales was "pleased to be able to welcome Ms Markle to the Royal Family in this way", said a statement from the palace on Friday. Ms Markle's mother, Doria Ragland, arrived in the UK on Wednesday, and met the Queen and the Duke of Edinburgh on Friday. From Prince Harry's side of the family, Kensington Palace confirmed the Queen's husband, the Duke of Edinburgh, will attend - despite recently recovering from a hip replacement. But Prince Harry's newest nephew, Prince Louis, who will be three weeks old at the time, will not be there. Prime Minister Theresa May and Labour leader Jeremy Corbyn are not on the guest list after it was decided there would not be an "official list of political leaders". Kensington Palace said that decision, which means US President Donald Trump will not attend, was taken in consultation with the government and reflects the fact Prince Harry is only sixth in line to the throne. It has also been confirmed that Barack and Michelle Obama, who are friends of the prince, have not received an invitation. More than 1,000 members of the public have been invited to the grounds of Windsor Castle and will be able to watch the arrival and departure of the bride and groom. Twelve-year-old Amelia Thompson, who was injured in the Manchester Arena attack, is among them. Ms Markle, 36, spent the last night before the wedding with her mother, Doria Ragland, at the luxury Cliveden House Hotel, in Buckinghamshire, about nine miles north of Windsor Castle. Prince Harry, 33, stayed 15 miles away at the Dorchester Collection's Coworth Park in Ascot, with his brother, the Duke of Cambridge. Ms Markle will arrive at the chapel by car with her mother. The princes will also travel together. What are people likely to wear? The dress code listed on the royal invitation requests a "morning suit or lounge suit" for men, and a "day dress with hat" for women. That means shirts, suits and ties with the possibility of top hats and waistcoats for men. Women will be expected to opt for knee-length dresses, with hat choices similar to those found at Royal Ascot. The details of Ms Markle's wedding dress remain a secret. Which celebs might be at the royal wedding? All of Ms Markle's bridesmaids and pageboys will be children. Princess Charlotte will be among six bridesmaids and her brother Prince George will be one of four page boys. Ms Markle will not have a maid of honour, Kensington Palace has said. The palace's communications secretary, Jason Knauf, said Ms Markle "has a very close-knit group of friends and she did not want to choose one over the other". "They're all going to be there in Windsor with her, in the days before in London," he added. "She's very pleased to have their support on the day." As expected, Prince Harry has asked his brother, Prince William, to be his best man. Prince Harry was the Duke of Cambridge's best man at his wedding to Kate Middleton in 2011. Kensington Palace said Prince William was "honoured to have been asked" and was looking forward to supporting his brother. The Archbishop of Canterbury, Justin Welby, will marry the prince and Ms Markle. Meanwhile, an American pastor will give the address - the Most Reverend Michael Curry is the presiding bishop of the Episcopal Church, a US branch of the Church of England. What music will they have? The couple have chosen a selection of choirs, soloists and musicians to perform at their wedding. They include the Choir of St George's Chapel, 19-year-old cellist Sheku Kanneh-Mason - who won the 2016 BBC's Young Musician, and gospel group Karen Gibson and The Kingdom Choir. An orchestra - fronted by Welsh soprano Elin Manahan Thomas - will also perform. She will be accompanied by trumpet player David Blackadder, organ player Luke Bond and state trumpeters from the Band of the Household Cavalry. What do we know about the reception? All 600 guests will attend a lunchtime reception at St George's Hall, which is being given by Her Majesty The Queen. Ms Markle is reportedly planning to break with the tradition for royal brides by making a speech. Later in the evening, the newlyweds will celebrate with 200 guests at a private reception less than a mile from Windsor Castle at Frogmore House, hosted by Prince Charles. The 17th Century country house and gardens - a former home to numerous royals throughout history - was the back-drop for the pair's engagement photos. Prince Harry and Meghan Markle have chosen an organic lemon and elderflower cake. In keeping with the transatlantic nature of the occasion, the couple have enlisted Californian pastry chef and food writer Claire Ptak, owner of the Violet Bakery in east London, to bake the cake. White garden roses, foxgloves and peonies - Ms Markle's favourite flower - will surround the couple on their wedding day. London-based florist Philippa Craddock has been chosen to create the floral displays for St George's Chapel and St George's Hall and locally sourced foliage will be used. Soon after the couple started dating, Ms Markle posted a picture of a bouquet of pink and white peonies on her now-deleted Instagram account and on another picture of peonies she said the flower made her "endlessly happy". Alexi Lubomirski will be the official wedding photographer. He took the photographs to mark the couple's engagement and says he is honoured to have the opportunity to capture the "next chapter in this wonderful love story". Mr Lubomirski, who was born in the UK but lives in New York, is known for his fashion magazine images of Beyonce, Gwyneth Paltrow, Julia Roberts and Scarlett Johansson. Pubs and bars across England and Wales will be allowed to stay open two hours later than usual - serving until 01:00 BST on the morning of the wedding day, and again after the couple are married. The date and location of the honeymoon have not been released yet - but Kensington Palace said it would not start immediately. They will carry out their first royal engagement as a married couple in the week after the wedding. What souvenirs are on offer? You may not be able to get your hands on the official wedding favours, but that needn't stop people from getting a souvenir to remember the day - especially if you like china. The official range of commemorative fine-bone china by the Royal Collection Trust includes mugs, tankards and plates. Meanwhile, Stoke-on-Trent pottery firm Halcyon Days is manufacturing a range of mugs, plates and teapots. The firm is one of 14 to hold royal warrants, a certificate for providing goods and services to the royal households. Reality Check: How much do we spend on royal memorabilia? Harry and Meghan: How will you celebrate the big day?